"I can honestly say that I have captured all of old Paris." A photograph shows the inside of the display of a clothing store like a parody of a theatrical space, where the photographer plays with ambiguity: while the vitrine triggers desire, the glass physically isolates the consumer who contemplates his own reflection mingled with the spectacle of the commodity. Direct, yet enigmatic, images by Eugène Atget earned him the title of "a modern art master" in his use of photography not only for aesthetic ends, but in order to detach the image from its social and cultural referent. Above and beyond their subjects, his photographs are regarded as the bridge between 19th century topographic photography and the so-called art documentary of the 20th century. His work expresses an uncompromising vision that took less account of technical precision, but rather focused on creating a record of pictorial space. Atget used photography to describe the different aspects of Paris opposed in many respects to the forms taken on by large-scale modernization. He chose specifically typical architecture before transformation, and small trades or "petits métiers" such as "ice-cream vendors", "wire-basket merchants" or "violet sellers" before their abolition. His framings and light treatment explore new perspectives in photography that allowed for both recording the historical documents of the world, and also subtly commented on the images represented. His compositions avoid famous landsmarks in order to focus on a smaller scale, sharing his own sense of vision. Paradoxically, he invented an innovative documentary aesthetic by using an old-fashioned wooden camera with a rapid rectilinear lens and the 18x24cm glass negatives that were common at this time. The combined weight of the equipment was around 20 kilos, a burden that Atget had to constantly carry with him when he explored the streets of old Paris by foot, descending the metro staircases, or when he travelled out to the suburbs by train. Ironically, in light of this burdensome camera, his work is associated with the modern figure of the carefree flâneur. Considering himself an artisan, Atget has become one of a cardinal references in the Surrealist art movement, while at the same time Man Ray and Berenice Abbott helped reveal his importance to photography. He destabilizes the fixed categories of photographic realism and art, combining and contrasting both dream-like qualities and documentary purposes. More than any previous photographer, and probably even artist, Atget fullfilled Charles Baudelaire's maxim: "That which is not slightly distorted lacks sensible appeal; from which it follows that irregularity - that is to say, the unexpected, surprise and astonishment - are an essential part and characteristic of beauty." Atget made 10,000 negatives from which he produced and sold an estimated 25,000 prints to individuals and institutions. His system for organizing this massive archive consists of classifying his work not by date or places but by topics such as landscapes, architectures, portraits or interiors. 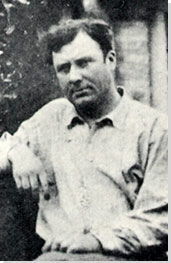 Jean Eugène Auguste Atget was born in Libourne (France) to working-class parents, Jean-Eugène Atget, a carriage maker and saddler, and Clara-Adeline Atget. His father changed careers to be a traveling salesman only to die a few years later on business. Shortly after, his mother, Clara, died as well. Faced with a harsh and unforgiving childhood, which left him orphaned at the age of five-years-old, he was raised by his elderly grandparents, Victoire and Auguste Hourlier, who lived in Bordeaux, France. Atget soon joined the seafaring life as a cabin boy. This image, depicted in an agrarian region in northern France, characterizes Atget's early style. The photographer identified himself with the French tradition of historicizing landscapes, with a total lack of reference to the classic conventions of framing and composition. This particular photo appears to have been influenced by Impressionist painter, Claude Monet, whose series of Haystacks was completed in 1890-91. The sleepy scene captures the quiet countryside and the timeless character of the French farmhouse lifestyle. The repetitive nature of the haystacks and the diagonal of the road push our view into the far-off distance. The scene is missing the presence of a farmer and livestock making it more of a meditation on the environment itself as the title suggests. 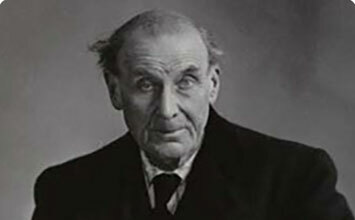 As a documentary photographer, Atget described himself as a keeper of records. Occupying a unique position at the crossroads between the classical and modern era, he shied away from modernity in order to better prepare for its arrival. He used archaism to confront heterogeneous realities: his subjects often belong to the past; his Duchampian "found" images in the world announces new artistic uses of photography as a way to record reality. Postmodern artists such as Cindy Sherman, Barbara Kruger or Richard Prince will extend this practice by using documentary photographs in their own work. This doorknocker, situated on a Parisian state institution building, epitomizes the grandeur of 18th century French architecture and decoration. Atget captures the quality of metal-smithing put into this doorknocker through the details of its wavy mane, furrowed eyebrows, and the careful pattern of the snakes' skin. He approached the ornament at a slight angle and emphasized the shadow and prestige. Atget worked with a large-format bellows camera, developing his own plates. His documentary purpose allows him to adjust contrasts in order to accent the details. He described the photo as, "completely beautiful", but there was another reason he sought to take highly detailed photos - in order to sell them to metalworkers, who would make replicas of the decorations. In 1890, he opened a studio specializing in source images for artists, architects, and set designers. The image was taken only a few years after an organization was established to preserve Paris's architectural heritage. He included it in his first album entitled, "Art in Old Paris." According to one of the great thinkers of the critique of progress - Walter Benjamin - this book announces the surrealist movement: "it gives free play to the politically educated eye." Bernice Abbott states that "we will remember him as an historian of urbanism, a true romantic, a lover of Paris, a Balzac of camera, from whose work we can weave a large tapestry of the French civilization." A ragpicker takes up the entire frame of Atget's shot on a Parisian street side. With the background blurred, all the attention is focused on the trade of the man who poses with a very large wooden cart behind him. In 1898 Atget embarked on a project with the quasi-encyclopedic aim of capturing the old city of Paris under threat from new urbanization. With a series on the forgotten jobs, he showed people's day-to-day environment without embellishment. A crowd of people shield their eyes to a solar eclipse taking place in one of Paris's public squares. The masses hold their viewing apparatuses in front of their eyes to view the moment when the moon blocks out the sun. The blurred nature of the photo comes from Atget's camera, whose glass plate negative needed a long exposure time to capture great depth of detail (his camera was best suited for taking images of buildings, not moving people). The mechanical vignetting is due to his having repositioned the lens relative to the plate on the camera as a way to correct perspective and control the image. This relief inset above the first floor window of the historic Chancellerie d'Orleans townhouse, also known as the Hôtel de Voyer d'Argenson, is an exact copy of a relief by French Renaissance sculptor, Jean Goujon made in 1549. Atget was particularly fascinated by the historic centre, whose buildings and magnificent palaces dated from before the French revolution. This atmospheric street view of the Panthéon is an example of what Atget became best known for: photographs of iconic French architecture. A cobbled brick road leads to a church adorned with a colonnaded dome built in Neoclassical style. The photographer's point of view is very original and innovative. He chose an oblique perspective rather than a frontal view. Moreover, he overexposed the film in order to bring out the fog-veiled Panthéon in the distance. This classically inspired sculpture situated in the Garden of Versailles shows the mythological Cretan princess, Ariane, laying seductively on her lounge. Traditional Greek linens wrap around her full-bodied figure and flow freely throughout the entire sculpture like the organic and sensuous lines that emerge from an unrestrained mind. While resting her eyes, she dreams about the Greek God of wine and fertility, Dionysos. This is one of Atget's more playful images that he created toward the end of his life. Fashion mannequins scatter a display case like human surrogates, showcasing the trendy female fashions of the day. Their exaggerated gestures make for an odd display that is further complicated by various reflections in the window. Tree branches, a building opposite the storefront, and Atget's own leg overlap the scene and create new shapes and references.